The International Olympic Committee is beginning a two-day visit to London for a progress update on the venues for the 2012 Olympic and Paralympic Games. The delegation will see the "big five" Olympic venues, including the stadium and velodrome, which are being built. The Aquatics Centre, Olympic Village and Press Centre will also be checked. Olympic Delivery Authority chairman John Armitt said: "It's clearly visible how much progress has been made since the IOC visited last year." 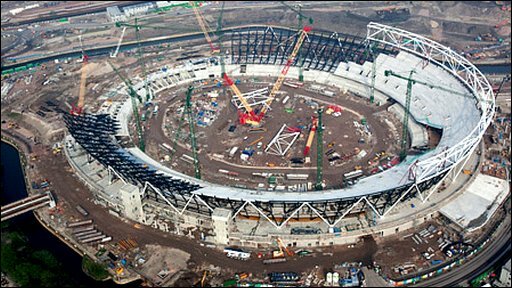 At the time of the IOC's last visit, there was little construction work to inspect, but the Olympic Stadium is starting to take shape with eight sections of the roof in place. Meanwhile the foundations for the velodrome are also finished and building work is well underway at the three other key venues. "The Olympic Stadium has changed the east London skyline, the Aquatics Centre roof is starting to take shape and the first residential blocks for the Olympic Village are out of the ground," said Armitt. London 2012 chairman Sebastian Coe added: "Seeing the Olympic Stadium and other venues on the Olympic Park taking shape is really exciting. "These are world-class facilities which will leave a lasting legacy for elite athletes and the community."